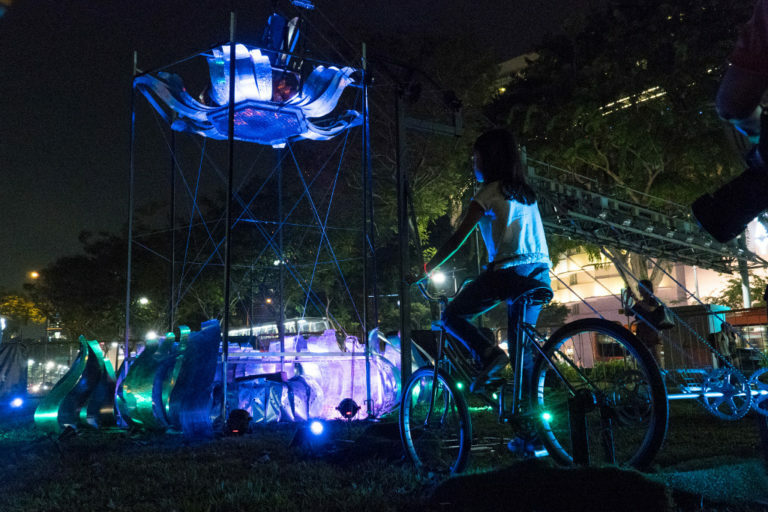 Our pick of 12 electrifying highlights that families and kids shouldn’t miss as the Singapore Night Festival 2018 sparks to life this weekend. 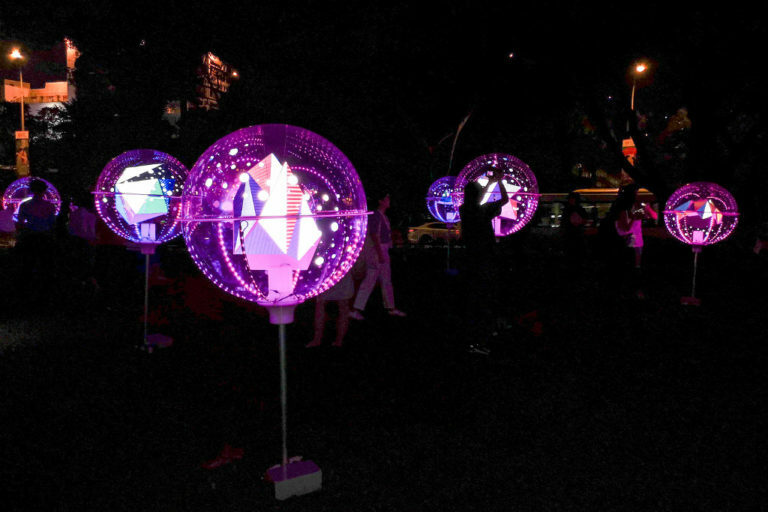 It’s time to Bring on the Night as the Singapore Night Festival sets Bras Basah.Bugis (BBB) alight once again. 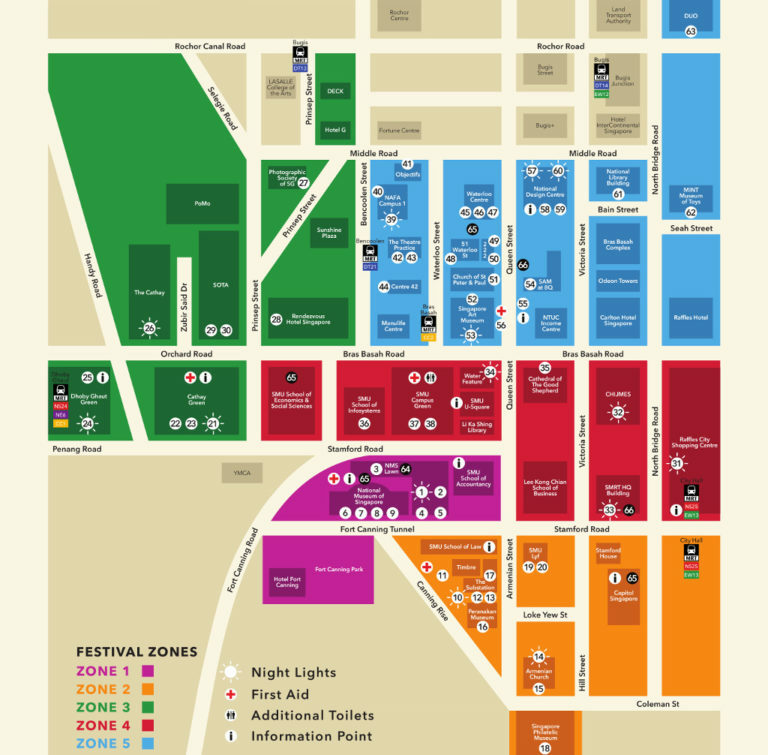 The annual festival returns to the arts and heritage district for its 11th edition from 17 to 25 August. It runs from 7.30pm to midnight nightly, with brilliant performances happening on the last three nights. While this list isn’t exhaustive in the least, we’ve picked out what we think are the high-lights – excuse the pun! – that families with kids will especially love. Explore the luminous Arctic Ocean, glowing Coral Gardens and Volcanic Sea in this surreal marine world…on land! 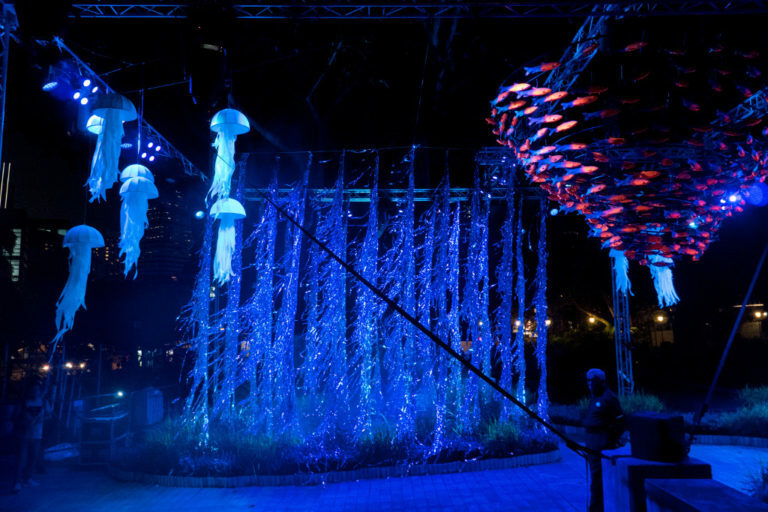 Join the students from LASALLE College of the Arts School of Dance and Theatre as they mimic fascinating deep-sea creatures in interactive performances. Although we were there in warm and humid weather yesterday evening, the misty atmosphere made it feel a lot cooler! Hidden away in the backyard of the historic Armenian Church is one of our favourite installations. 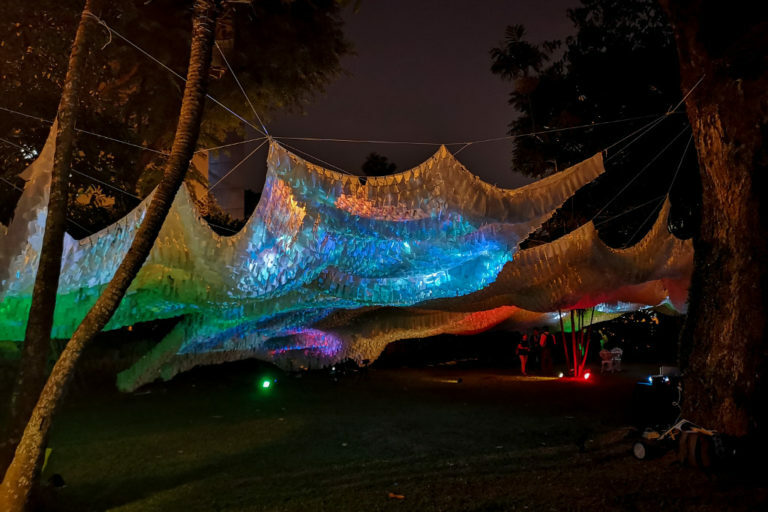 Pulse is an interactive cloud made of fabric designed to reflect humanity and how digital media influences our lives. Encourage the kids to speak, clap and even sing, and watch the magic happen. But be careful, there are eyes watching you too! Festival-goers are invited to take The Leap of Faith. 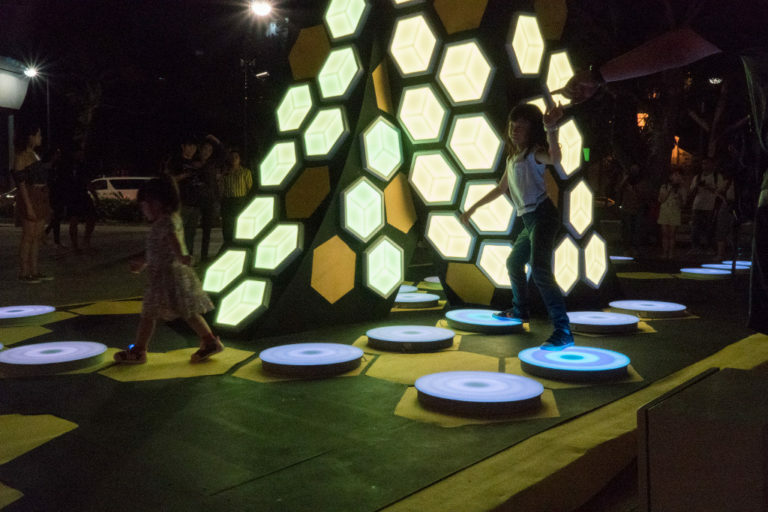 The kids will have fun hopping, skipping and jumping across interactive floor pads that light up and change colours. The artist behind it hopes to remind us of the importance of every step we take. No matter how uncertain the path, we can learn from experiences along the way, if only we have faith. Life-changing innovations often begin with a single spark. Inspired by the human mind’s ability to ignite ideas and innovation, Starlight Alchemy invites visitors to create Ember Rain. Simply start by pedalling a bicycle, which sends chunks of charcoal up to the top of a five-metre-tall tower. We watched in awe as sparks showered down from its peak, and you will too. The field that’s dominated by shining orbs just invites you to step in. Inspired by the solar system, a bright beam of light a.k.a. the Sun is surrounded by planets. Help them on their orbits and watch as lights create different patterns, colours and images from every angle. Insider tip: Flash a light (eg. your smartphone camera flash) at them and see how they respond! 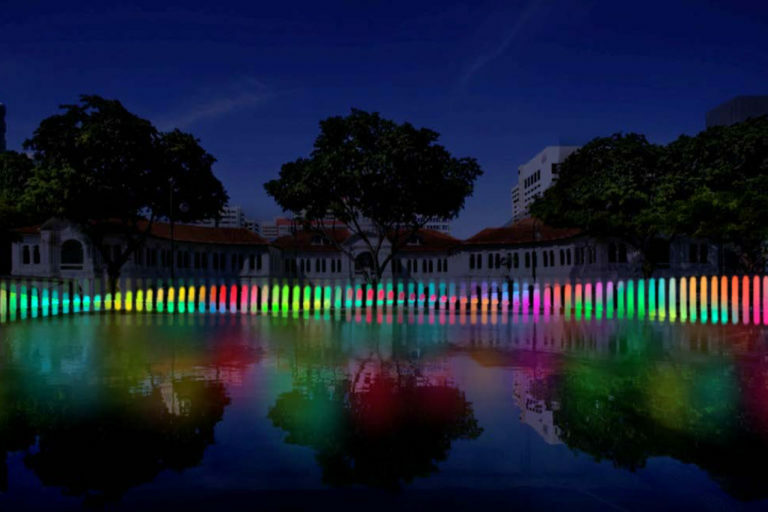 Visitors are invited to move and twist a series of light rods suspended on the Reflection Pool in Light Wave. You’ll trigger a wave motion which changes dynamically according to how you manipulate them. Remember to get your photos of not just the light rods, but their reflection beautifully mirrored in the water too. Sadly, we didn’t get to put it in action ourselves last night, but we can’t wait to go back this weekend! 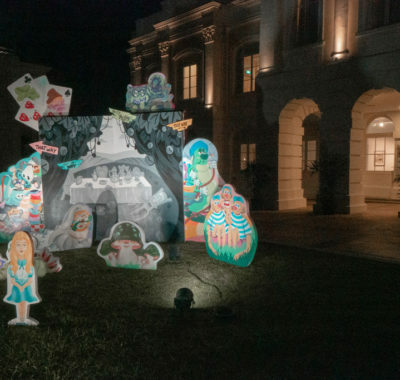 If the kids enjoyed the Imaginarium exhibition at the Singapore Art Museum, then they’ll love this. This immersive journey through space is designed to trick visual and aural senses on both cosmic and atomic scale. 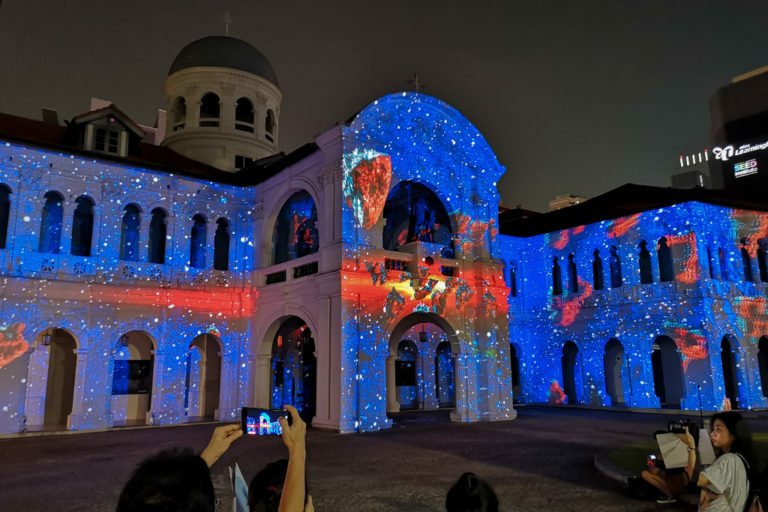 Projection mapping installations have definitely been one of the biggest highlights in previous editions of the festival, and this one on the SAM façade is no less mesmerising. Which child hasn’t folded at least one paper aeroplane? 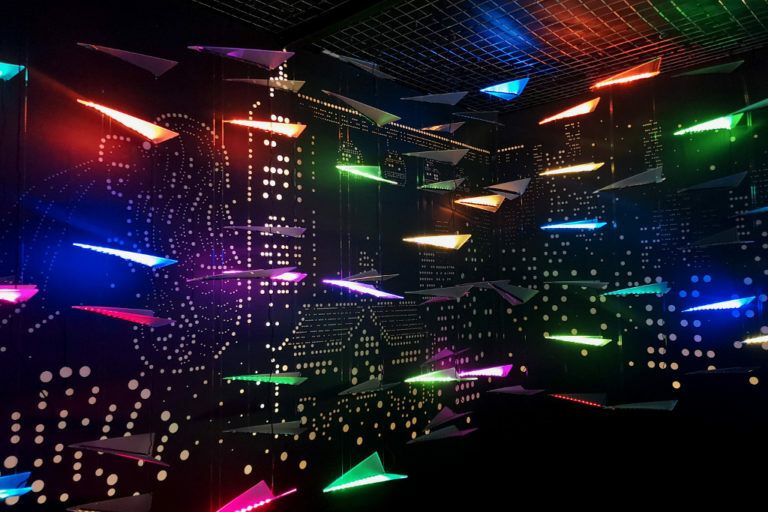 The Search pays homage to this with an installation of over 400 paper planes. Made of 100 per cent recyclable materials, it celebrates our journey of self-discovery − and does so sustainably! Singapore-based pianist Eric Chiryoku composed the accompanying soundscape that complements the installation perfectly. Psst…this is also a superb selfie op! 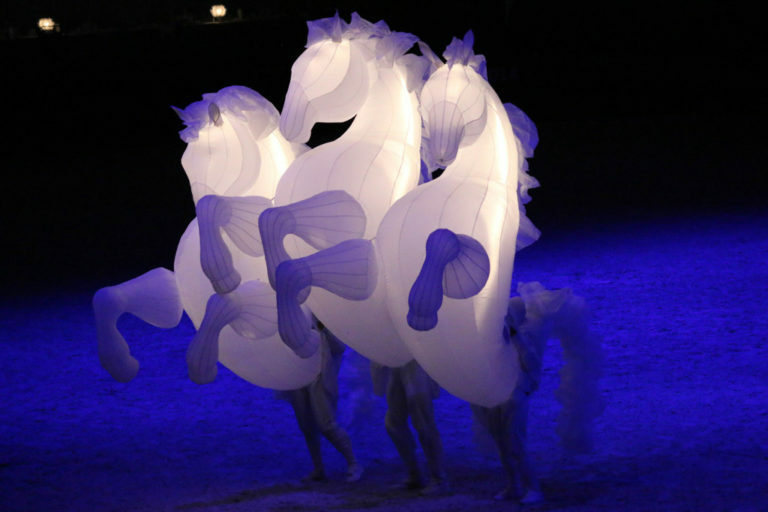 Don’t be surprised when you bump into a team of luminous giant horses prancing around the BBB precinct! The roving act FierS à Cheval (French for Proud Horses) involves bizarrely dressed science fiction Venetians transforming into their equine counterparts in a wordless magical musical. The performance will transport kids to a fantasy world where their wildest dreams come true. Star Wars movie fans will love this one. Remember how much fun it was whenever Sith lords used force lightning against the Jedi? 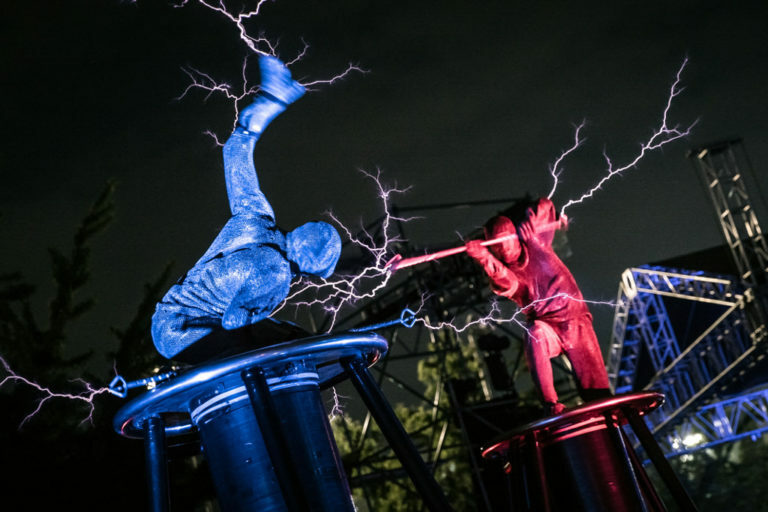 Now experience it in real life, as Lords of Lightning harness multi-million volts of white-hot electricity in battle. It’s inspired more by Nikola Tesla than Darth Sidious, but the crackling bolts of lightning are just as spectacular. Don’t get singed…just kidding! Over at the SNF2018 Festival Village, there’ll be booths offering artisan crafts by local makers. The kids will love Angel Wings Workshop’s adorable sock toys while mums can check out mrphy’s quirky home accessories. Can’t get enough of those IG-worthy street foods? 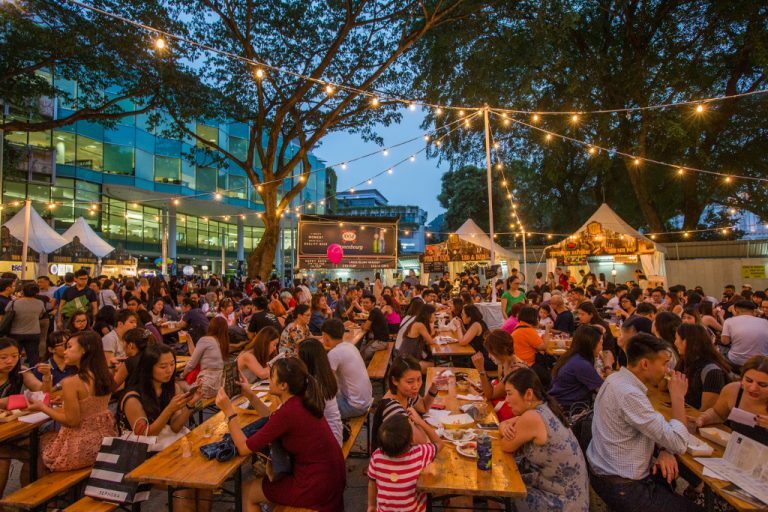 Then you’ll be glad to know that over 20 of your favourite pasar malam stalls will be popping up. 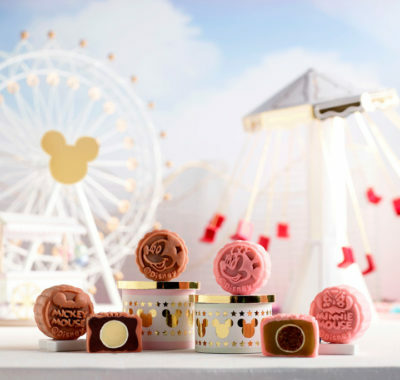 Enjoy everything from Uncle G’s Handmade crackling roast pork to Rainbow Works’ unicorn-themed treats. While shopping and snacking, be serenaded by the performers gracing the Festival Village Stage. Getting the groove going will be DJ Tang, Krysta Joy by Invasion, ELECTRYX by ONYXFire and many more. It’s the perfect setting for a family picnic on the green, so remember to bring a picnic mat along! 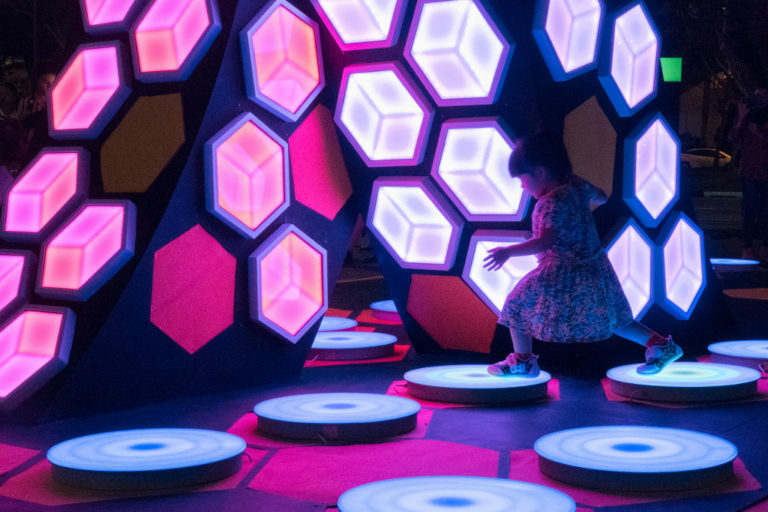 Inspired by the fairground attraction of coin-activated automatons, this clever interactive installation will amaze the little ones. 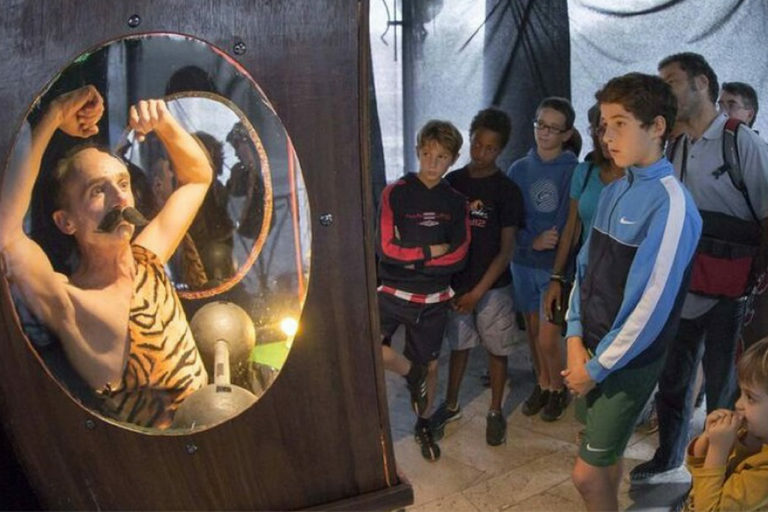 Let them insert a coin into the ‘machine’ and watch their jaws drop as it comes to life. 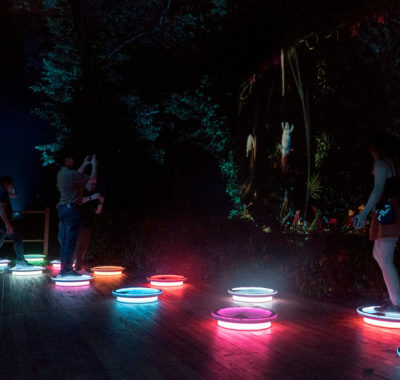 Coloured bulbs light up and circus music plays, even as the performers within begin their storytelling magic. Have a few coins at the ready, parents!